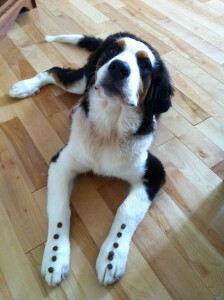 My boyfriend and I have now attended puppy class twice with our Burmese mountain dog mix Rudy. So far puppy class has been a ton of fun and Rudy really loves socializing with all the other puppies. She has learned how to come, sit, lay down, go to place and look. As we all know having a puppy can be frustrating at times, so it very reassuring to have someone teach you how to communicate clearly with your puppy and how much to expect from your puppy. I was having a difficult time crate training Rudy so I sent unleashed potential a message. We learned about crate training and more. Since then Rudy has slept in her crate for 5 nights in a row now! I am so happy I signed Rudy and I up for puppy class and I can wait to go back next week!